ST DAVID’S HALL is launching an exciting new series which mixes contemporary classical music with cocktails in the L3 Lounge! NightMusic brings together some of the most exciting and distinctive voices working today, and provides a more easy-going way to explore new directions in music. Get ready to revel in thrilling performances from electro-acoustic soloists and convention-flouting ensembles to the best new Welsh music courtesy of Tŷ Cerdd! Starting the season in style is The Hermes Experiment, who are by no means your average quartet. 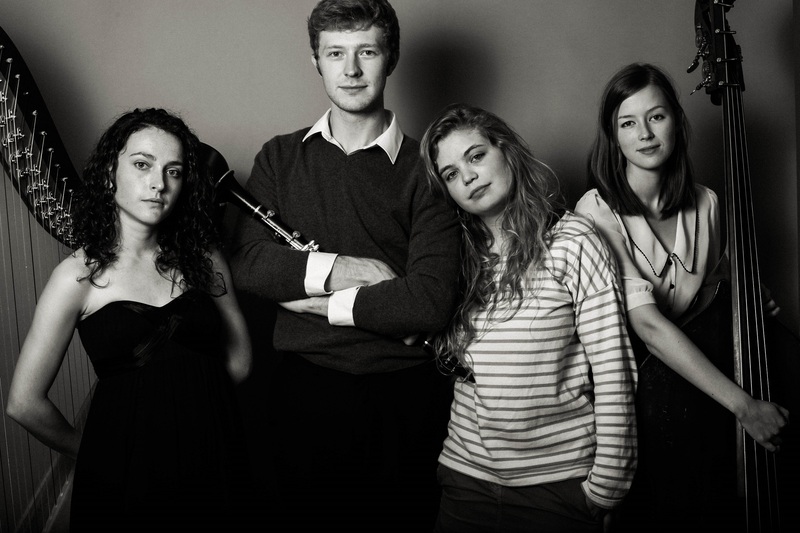 The 2016 Tunnell Trust Award winners and Park Lane Group Young Artists 2015/16 combine harp, clarinet, voice and double bass to produce a stunning sound of off-beat, idiosyncratic possibilities. Not only do the four-piece delight in pushing the boundaries with their innovative arrangements and live free improvisation, they regularly commission new works. These have included no less than 40 composers from rising stars to elder statesmen. Recent highlights include a showcase performance at Tallinn Music Week 2017 and the ensemble’s debut at London’s Southbank Centre and Kings Place. Always striving for cross-disciplinary collaboration, The Hermes Experiment (named after an experiment using the HERA particle accelerator in Hamburg) created a ‘musical exhibition’ with photographer Thurstan Redding in 2015, and last year developed a new interpretation of Shakespeare’s The Winter’s Tale during an Aldeburgh Music Residency. All NightMusic performances take place in the intimate setting of the L3 Lounge amid atmospheric lighting and spoken introductions from the performers to open up their musical worlds. Every event will be as informal as it is immersive, with plenty of opportunities to talk to the artists between sets. Why not venture up to our brand new and luxurious Gin Lounge on the fourth floor? As an added incentive, we’ll even include your first drink within the ticket price! Cool contemporary sounds and chilled cocktails – NightMusic provides a classic combination and it’s coming soon! Includes draught beer* (from Level 3 bar only), wine, soft drink or a gin and tonic from The Gin Lounge.